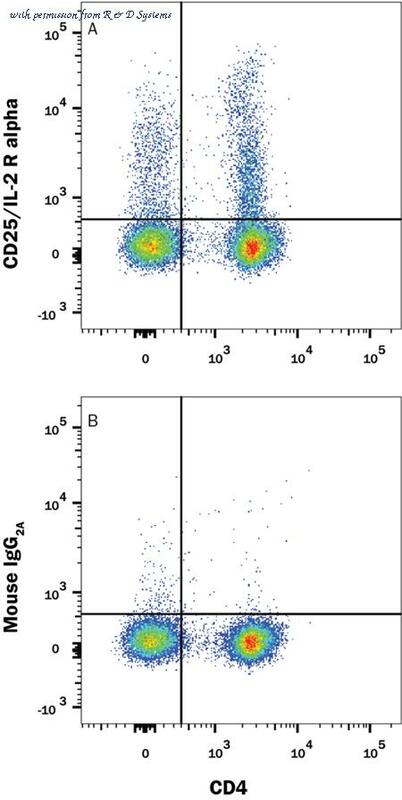 Detection of Human CD25/IL-2 R alpha in Human PBMCs by Flow Cytometry. 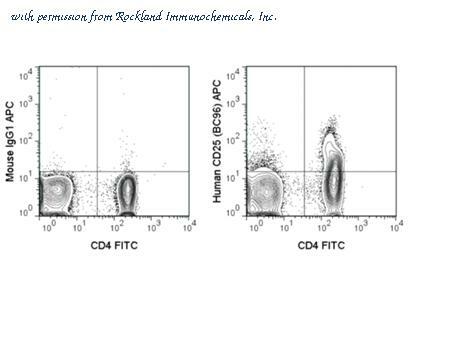 Human peripheral blood mononuclear cells (PBMCs) treated with 20 ng/mL Recombinant Human IL-2 (Catalog # 202-IL ) and 10 ng/mL Recombinant Human TGF-beta 1 (Catalog # 240-B ) for 2 days were stained with Mouse Anti-Human CD4 APC-conjugated Monoclonal Antibody (Catalog # FAB3791A ) and either (A) Mouse Anti-Human CD25/IL-2 R alpha PE-conjugated Monoclonal Antibody (Catalog # FAB1020P) or (B) Mouse IgG2A Phycoerythrin Isotype Control (Catalog # IC003P ). View our protocol for Staining Membrane-associated Proteins . 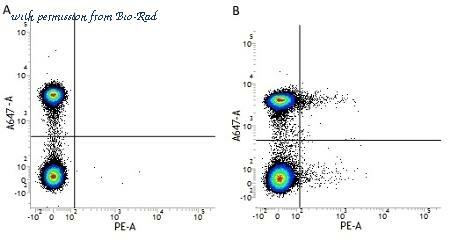 Detection of Recombinant Human and Rat CD25/IL-2 R alpha by Western Blot. 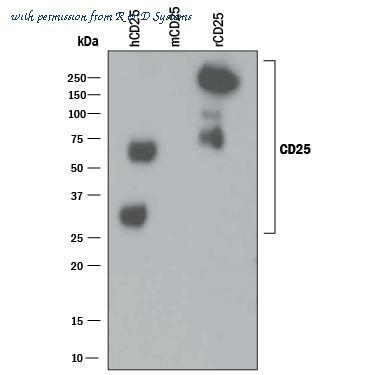 Western blot shows 25 ng of Recombinant Human CD25/IL-2 R alpha (Catalog # 223-2A ), Recombinant Mouse CD25/IL-2 R alpha (Catalog # 2438-RM ) and Recombinant Rat CD25/IL-2 R alpha Fc Chimera (Catalog # 5156-RM ). 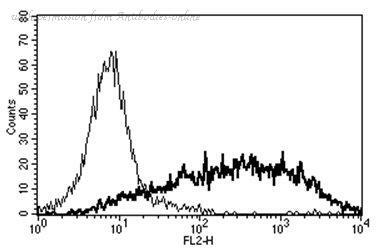 PVDF Membrane was probed with 1 ╡g/mL of Mouse Anti-Human CD25/IL-2 R alpha Monoclonal Antibody (Catalog # MAB623) followed by HRP-conjugated Anti-Mouse IgG Secondary Antibody (Catalog # HAF018 ). 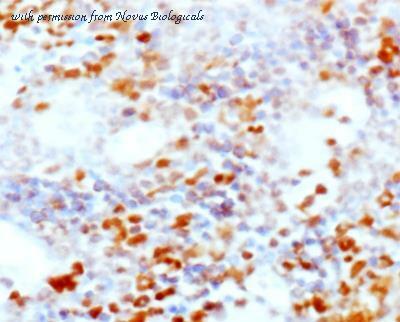 Specific bands were detected for CD25/IL-2 R alpha at approximately 30-250 kDa (as indicated). 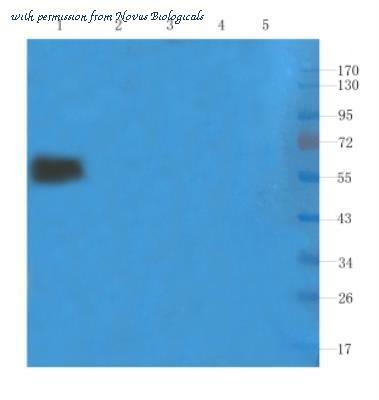 This experiment was conducted under non-reducing conditions and using Immunoblot Buffer Group 3 . 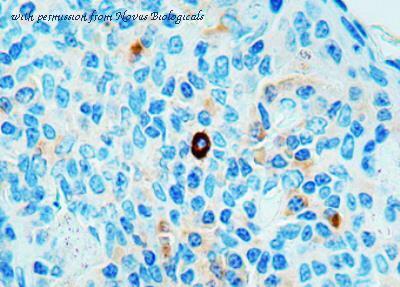 Immunohistochemistry-Paraffin: IL2RA/CD25 Antibody (IL2R.1) [NB600-564] - Formalin fixed paraffin embedded human tonsil stained with CD25, using ABC method. Western Blot: CD25/IL-2 R alpha Antibody (Basiliximab) [NBP2-52661] - Staining of Human thyroid cancer (lane 1), rat spleen (lane 2), mouse lymph node (lane 3), mouse thymus (lane 4) and rat small intestines (lane 5)samples were resolved on a 10% SDS PAGE gel and blots probed at 1 ug/ml before being detected by a secondary antibody. 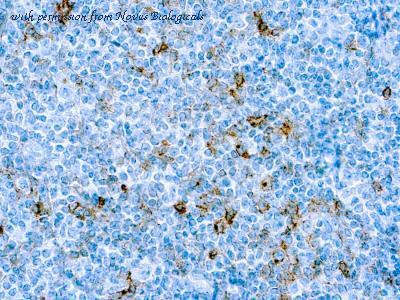 Immunohistochemistry-Paraffin: CD25/IL-2 R alpha Antibody (PC61.5.3) [NB600-710] - Analysis of formalin-fixed paraffin-embedded tissue section of spleen from normal Mouse using CD25/IL-2 R alpha antibody (clone PC61.5.3.) at 1:100 dilution. 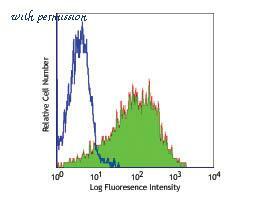 Flow Cytometry of Mouse anti-CD25 Fluorescein Conjugated Monoclonal Antibody. Cells: human peripheral blood lymphocytes. Stimulation: PHA (3 day). 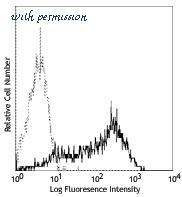 Antibody: (Dotted Line) FITC Mouse IgG1 kappa isotype control; (Solid Line) Fluorescein Anti-CD25 mouse antibody using 5 ul. Flow Cytometry of Mouse anti-CD25 Phycoerythrin Conjugated Monoclonal Antibody. Cells: human peripheral blood lymphocytes. Stimulation: none. 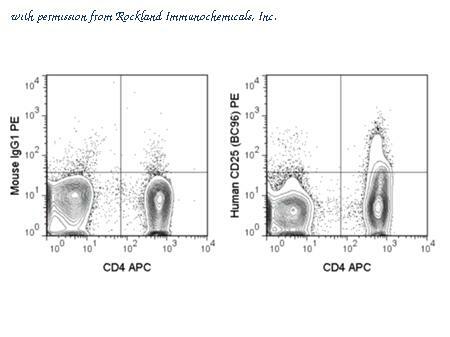 Antibody: (LEFT) PE Mouse IgG1 kappa isotype control and APC Anti-CD4 using 5 µL; (RIGHT) Phycoerythrin Anti-CD25 mouse antibody and APC Anti-CD4 using 5 µL. Flow Cytometry of Mouse anti-CD25 Allophycocyanin Conjugated Monoclonal Antibody. Cells: human peripheral blood lymphocytes. Stimulation: none. 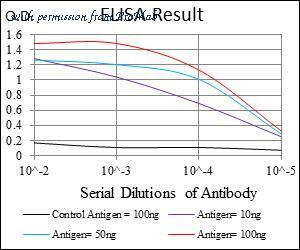 Antibody: (LEFT) APC Mouse IgG1 kappa isotype control and FITC Anti-CD4 using 5 µL; (RIGHT) Allophycocyanin Anti-CD25 mouse antibody and FITC Anti-CD4 using 5 µL.